I'mma let you finish, but. . .
You know the Uffizi Gallery is LEGIT since it was built by an art historian/painter/architect. The first ever of such talented folks was 16th century’s lauded lad, Giorgio Vasari and his baby was this here Uffizi Gallery in Florence. He was commissioned by the well-known patrons (plus cash cows) of that time i.e. the Medici’s. Although the original purpose of this building was not to house artworks. It was actually supposed to be the office space for Florentine magistrates. In case your Italian’s a bit rusty…Uffizi means offices. This U-shaped building is surely stunning, but it came at a cost. Many surrounding buildings had to be demolished in order to build the Uffizi. However, you can still track some remnants of the old church that used to sit in that very spot. If you see some aisles and get the urge to kneel down and pray to Jesus, means the old church is haunting ya’. Vasari definitely was the guy who got the building started but later on, other architects added to it. One room called the Tribuna, was added by Bernardo Buntalenti and is fully pimped up with costly, decorative material like precious stones, marble and shells. The gallery became a place for the Medici’s to hang up all the paintings and sculptures they commissioned. Must be nice to have your own personal gallery in Florence! It’s probably necessary if you’re hoarding stuff by da Vinci, Botticelli, Giotto and Caravaggio…to name a few. Hoarding might be a tad unfair to use here…since the gallery was open to the public by request. Later on though, in 1765, the gallery became totally open to the public. So anyone can go traipsing in now to catch an eyeful of this Florentine landmark! After the ruling house of Medici died out, their art collections were gifted to the city of Florence under the famous Patto di famiglia negotiated by Anna Maria Luisa, the last Medici heiress. 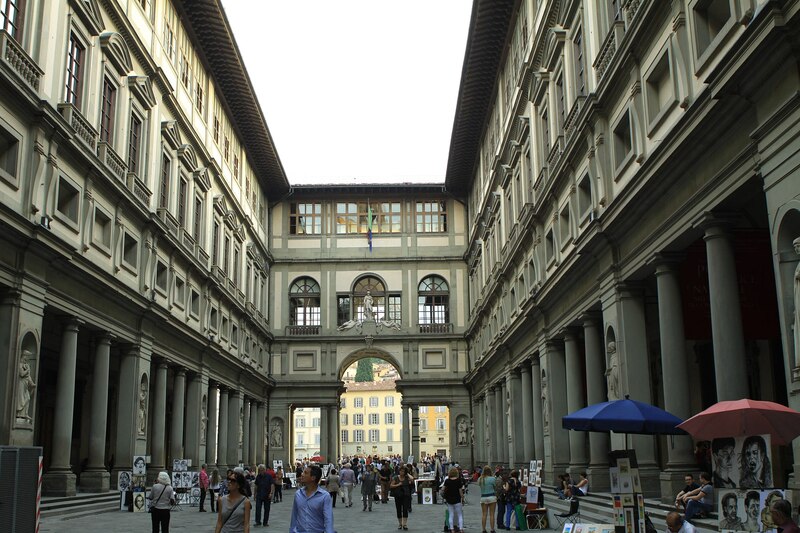 The Uffizi is one of the first modern museums. The gallery had been open to visitors by request since the sixteenth century, and in 1765 it was officially opened to the public, formally becoming a museum in 1865. Today, the Uffizi is one of the most popular tourist attractions of Florence and one of the most visited art museums in the world. Check out the full Wikipedia article about Uffizi.